By posting this recipe I am entering a recipe contest sponsored by the California Walnut Commission and am eligible to win prizes associated with the contest. I was not compensated for my time. Walnuts are incredible. In just one ounce of walnuts, you get 4 grams of protein, 2.5 grams of omega-3 alpha-linolenic acid, and 2 grams of fiber. They’re great for your brain and your heart, and are a rich source of antioxidants. And they’re yummy, too! Plus, they’re versatile: walnuts are wonderful on their own, but they also make a great addition to trail mixes and granola, and are an easy, crunchy topper for salads, yogurt, oatmeal, and desserts. With all of their health benefits, and with all of the ways to use them, there are so many reasons to incorporate more walnuts into your diet. This fresh, summery fruit salad is topped with crunchy walnuts and drizzled with sweet, tangy honey-lemon dressing. In a medium bowl, toss the sliced fruit together with the chopped walnuts and raisins. Set aside. Whisk the lemon juice, honey, yogurt, and optional ginger together until combined. *For a vegan alternative, substitute with pure maple syrup and a vegan-friendly yogurt. 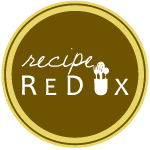 Be sure to check out more delicious ways to use walnuts from other Recipe ReDux members! Shared at Meatless Monday with Deborah and Sarah; Meatless Monday with Running on Happy and the Fit Foodie Mama; Tips & Tricks Link Party; Wow Us Wednesdays; What’s Cookin’ Wednesday; Thoughts of Home on Thursday; Weekend Potluck; Healthy Vegan Fridays; Peace, Love, Link Up. For a complete list of where I share, click here. Looks really yummy. I haven’t had fruit salad since last summer. This is the perfect time of year to try making your recipe. So appetizing! Thank you so much for sharing your healthy and delicious Fruit and Walnut Salad with Honey-Lemon Dressing with us on the Healthy Happy Green and Natural Party Blog Hop. I’m pinning and sharing. I LOVE salads with fruit and nut on the top – so good. Thank you for sharing at #HomeMattersParty this week. I love a fruit salad, this looks delicious. Thanks so much for sharing with Full Plate Thursday and come back to see us real soon! This fruit salad with dressing looks so delicious and refreshing! I’m a big fan of walnuts too! Thanks for sharing this yummy recipe at my Creative Ways Link Party! Ooh, sounds so refreshing and delicious! Thank you for sharing at Merry Monday!